“Baby, it’s cold outside…” Yes! Yes, it is cold outside. The temperatures have fallen and residents from Cleveland Heights, Ohio, to Willoughby, Ohio, aren’t sure when they will feel a warm breeze again. Many people tend to stay tucked in the warmth of their comfortable homes when they aren’t venturing to work, school, or the store; however, January and February bring with them feelings of restlessness and people starting to look for cold weather activities. 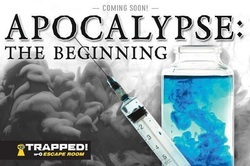 People who start to experience cabin fever from Middleburg Heights, Ohio, to Broadview Heights, Ohio, can visit Trapped! Escape Room online to book one of their 16 indoor gaming rooms for a fun night out. Whether it’s a weekend activity or family fun, anyone looking for things to do in the winter will be highly satisfied with the wide selection of themes at this local escape room venue. Many people find that doing the same weekend activities gets rather boring after doing them repeatedly, whether it’s bowling with friends or waiting for the latest movie debut at the theater. The excitement of the holidays throughout November and December keep people’s minds occupied, but then the cold, dark nights after the first of the year sap their energy. Someone who attends the local college may be looking for cold weather activities for a fun night out with her dorm mates, and remembers that she truly enjoyed the entertainment at Trapped! Escape Room when she went during the summer with her family. She ventures online to book a room and finds that there are 16 different themes from which to choose at four different locations throughout Cleveland. She’s awfully excited as she realizes that they could take the time to pick one every weekend and still not have completed them all before spring arrives. Trapped! Escape Room offers fun things to do in the winter, all while taking advantage of the differing qualities in the participants. This indoor gaming facility allows people to use their logic and puzzle-solving skills, as well as creating a working relationship between those involved in the game. Middleburg Heights offers The Inside Job, Labyrinth, and Cereal Killer, while Cleveland Heights offers The Cell, Pirate Tavern, Chainsaw, and Apocalypse. Gamers will find Cereal Killer, Rum Closet, and the Edge of the Enchanted Forest at Willoughby, as well as Zombie Garage, Chaotic Classroom 1 and 2, and Darkroom at Broadview Heights. As game players arrive, they find that they will get 60 minutes for most rooms, 30 in Darkroom, to find and decipher the clues that they are given in order to find the key that solves the room’s theme and opens the metaphorical door. This local escape room always has a Gamemaster available, who comes in at the end to solve any unanswered questions. When it comes to finding new things to do in the winter in and around Cleveland, Trapped! Escape Room has mastered cold weather weekend activities. This indoor gaming facility not only offers a fun night out, but also a vast array of difficulties and themes so that any personality and age can enjoy themselves. Whether it’s a team building experience for a business in or friends getting together, this local escape room can satisfy anyone’s need for fun. This entry was posted in Entertainment, Group Gaming and tagged cold weather activities Cleveland Heights Middleburg Heights Broadview Heights Willoughby Ohio, fun night out Cleveland Heights Middleburg Heights Broadview Heights Willoughby Ohio, indoor gaming Cleveland Heights Middleburg Heights Broadview Heights Willoughby Ohio, local escape room Cleveland Heights Middleburg Heights Broadview Heights Willoughby Ohio, things to do in the winter Cleveland Heights Middleburg Heights Broadview Heights Willoughby Ohio, Trapped! Escape Room, weekend activity Cleveland Heights Middleburg Heights Broadview Heights Willoughby Ohio by admin. Bookmark the permalink.